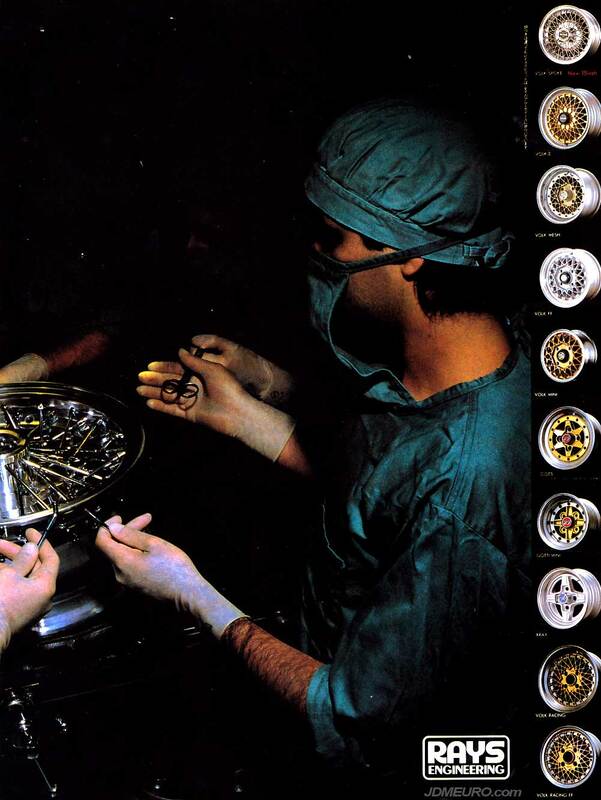 Rays Engineering / Volk Racing has been manufacturing JDM Wheels for over 40 years, this ad is only about 30 years old. From wire wheels, to the famous Volk Racing Mesh series, to collaborations with the french Gotti Wheels, Rays Engineerng makes a diverse range of wheels. Pictured are the Rays Engineering Volk Spoke, Rays Engineering Volk II, Rays Engineering Volk Mesh, Rays Engineering Volk FF, Rays Engineering Volk Mini, Rays Engineering Gotti, Rays Engineering Gotti Mini, Rays Engineering Xray, Rays Engineering Volk racing, Rays Engineering Volk Racing FF.